Snow reports this morning already seem to verify the lower end of the final forecast in many areas. As always, there are some lower but also some higher spots. 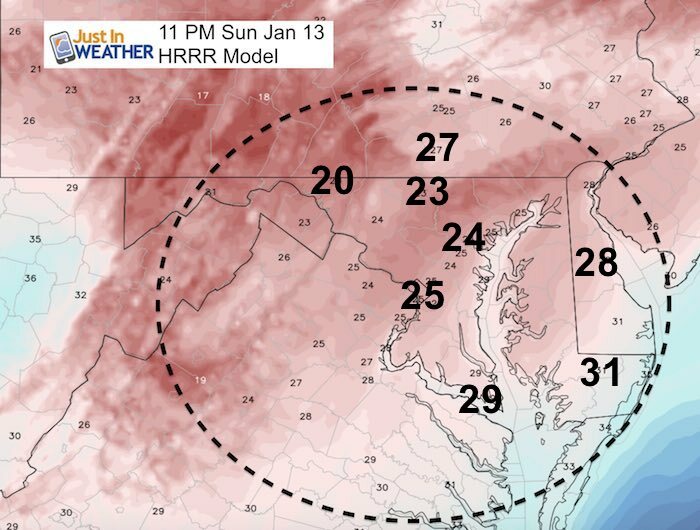 There is more to this storm and why my snow expectation along with many others increased: The second part of the storm is starting to take shape now. Winter Storm Warnings for most extended to Midnight! Looking at the radar may be deceiving. The storm is not done. That was the issue all week with low or high forecast totals. The reason for my bump and the increase to Winter Storm Warning across much of our region has been what we are waiting for now: Phase Two! Here is the morning radar that appears to be breaking up on the north side. That is just the lull during the storm transition. The Coastal Storm will develop as upper level energy transfers east. That will fill in the radar again. Southern Maryland: Some thawing today, but snow returns this evening and tonight. That will lead to more ice problems. Compare this to the new updated snow simulation slider below. We are not done yet. As the coastal storm develops, to will appear as if snow is getting heavier and spreading north. Also, rain may move north in southern Maryland and lower Delmarva. This will with back to snow by evening. Snow will reach the beaches again tonight. Please click here to see my complete morning forecast with additional snow totals and interactive snow report map. Still below freezing for many. 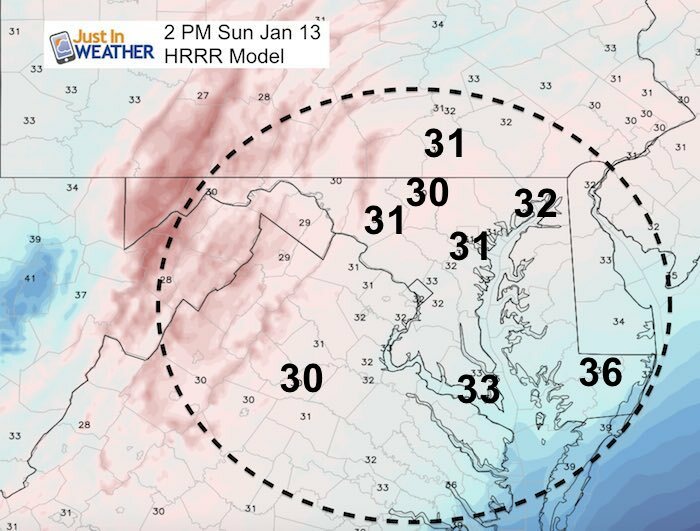 Brief thaw in southern Maryland but that will only add to icing. As the cold air and snow returns, any places that were wet will ice up. Expect road problems and school issues Monday morning. It looks like there will still be clean while in the freeze. 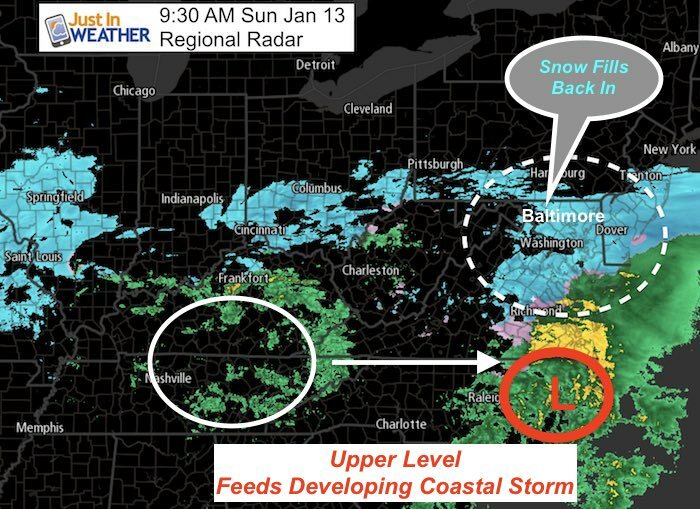 The lower Eastern Shore will have fresh snow until Monday morning to deal. NEW: Individual Items Are Now Available A La Carte. 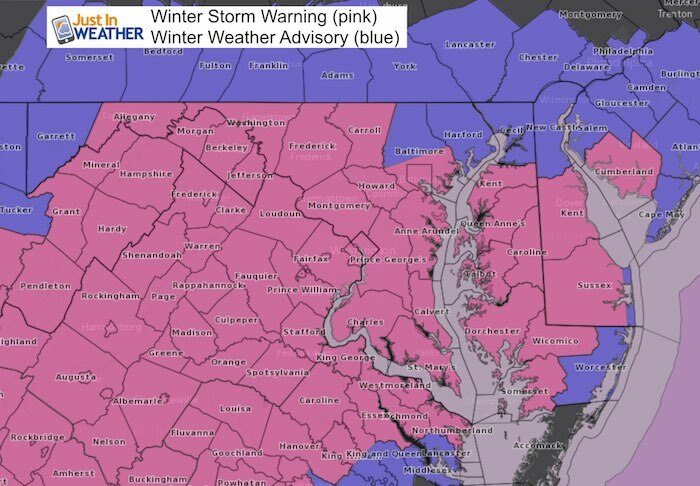 Winter Storm Warnings for most extended to Midnight! Lower Eastern Shore until Monday morning.